I showed you the pictures of the gaming table I helped my friend 'Mike' build. 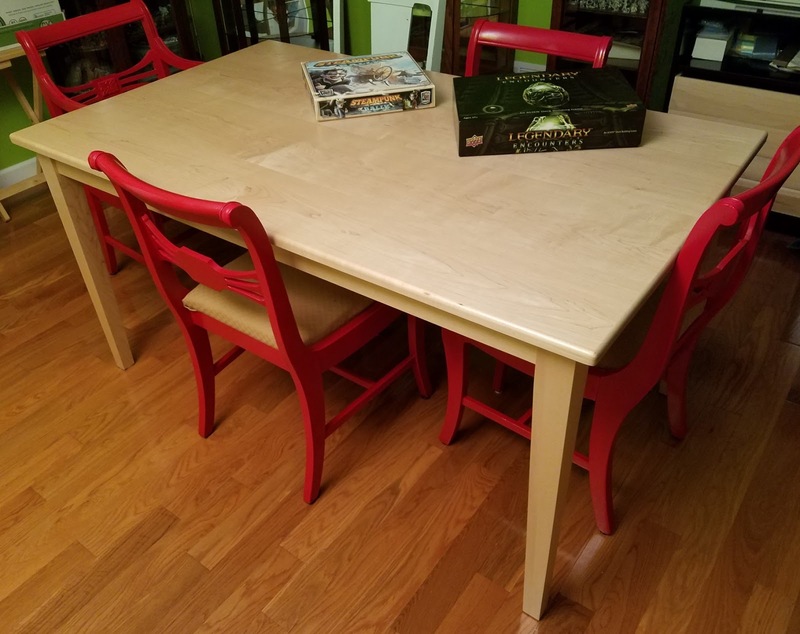 I showed you pictures of the game table I built and gave to my friend in Jersey. The natural next question is, "what am I using for a game table now? Must be something awesome, right?" Yup, that's it... I know, it looks like a kitchen table. I mentioned my concerns with my first gaming table. It was an awkward height for playing board games or miniature games and it was too big to play board games at comfortably. Since I haven't played miniature games in years I wanted something that would be convenient to play board games at. And why are the chairs red? We bought them from a garage sale and they were pretty beat. We gave them a quick sanding, painted them red and gave them a couple coats of polyurethane. But why red? I wanted our game room to have bright cheerful colors. Check out the bright green on the walls. My new game table is made entirely from hard maple. The top is 3' x 5' x 3/4" and is a comfortable 30 inches off the ground. The legs are tapered and are probably a little chunkier than they needed to be. The skirt is attached to the legs using a mortise and tenon joint. I cut the mortises using a jig I built from plans - maybe I'll talk about this in a different post - that uses a router which is why the corners are rounded. I rounded the corners on the skirt board tenons rather than trying to chop the mortises square. The top is attached to the legs with 'buttons'. This is a very simple table that was essentially my own design. When I made it it was a good stretch of my skills. I was and am pretty happy with it. It works well, is nicely sized and is very stable and solid. I've considered making a drop-leaf table that would also end up being 3' x 5' that would be the same height. That way if I wanted a larger gaming top I could just put the two together but otherwise I could drop the leaves and set the drop-leaf table to the side. But that's another day.